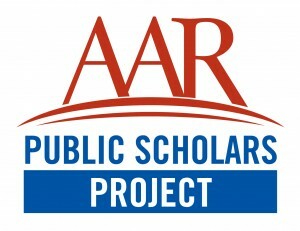 We invite you to attend our webinar on April 12th at 12:00 pm ET, Religious Studies in Television and Film: Promising Venues for Public Scholarship, hosted by the Public Scholars Project, a joint initiative of the Public Understanding of Religion Committee of the American Academy of Religion and of the Religious Freedom Center of the Newseum Institute. We will discuss how religious studies scholars can engage different publics through television and film. We are pleased to host co-presenters Liz Kineke, Producer at CBS Religion & Culture, Daniel Tutt, Director of Programs and Producer at Unity Productions Foundation, and Michael Wakelin, Executive Producer at TBI Media. The webinar will include a presentation and extended Q&A. Please RSVP here for a link to the webinar URL.